PBP Week 30: O is for Owls. I was ahead of myself last week, but do really know the alphabet so back to O! I have an owl obsession. I have a thing for birds, just naturally. When I was little I was afraid of them – because I watched Alfred Hitchcock’s The Birds hundreds of times. I thought Tippi Hedren (as Melanie Daniels) was the most glamorous woman I’d ever encountered – we also shared a first name. My fears aside, as far as totem animals or animal spirit guides go, mine have been mostly birds. I had a raven phase, a hawk phase in college (literally ran into them everywhere), then blue birds, finches, sparrows… now finally it’s the owls. I am stuck on owls and though I love my king fishers, woodpeckers, sparrows, robins, blue birds, hawks, eagles, mocking jays, bluejays, crows, doves (see, for someone who has never been “into” birdwatching I can identify many on sight and even sound alone)…. none of them hold the the same magic and fascination as Owls. 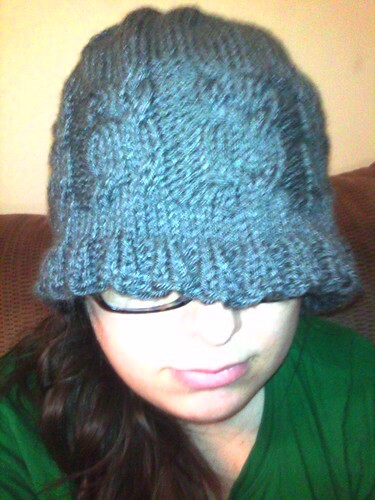 My owlie beanie, knitted by me last night. As I have rounded out my occult education with astrology and association charts from going to esoteric things I simply memorize into things that are connected like a web in my brain: the birds, the Owls, make sense. See, I believe that even if I don’t understand how these associations work: I know that they work together. I am a Libra. I am an air sign. I am communicative, dominant, I have great stamina but need to work on being in for the long haul… I am flighty, and sometimes full of hot air. It kind of follows that I notice other things that glide on the wind: birds, fairies, butterflies… mostly birds for me. In my life, birds and now owls are a symbolic theme. They are the messengers who drop in to teach me lessons, hopefully one day I will get the hang of riding on the currents of the wind. I have a friend who’s Native American; he is always offended by my owl love. He thinks they are bringers of evil and death. Now, not to disrespect anyone’s beliefs but I have to say: they are in some ways but are those things necessarily negative? If you don’t embrace the darkness to some extent it is impossible to embrace the light. So, aside from his belief about owls, there are other interpretations out there. Owls were sacred to Athena in ancient Greece. Actually, Athena choose the owls to be her companion and mascot because of their seriousness and wisdom: which is pretty cool. Owls are often thought of as messengers between the spirit world and our world. This belief is one reason owls were associated with witches and witchcraft: they acted as messengers for witches. Owls can also bring prophecies to their companions. In the natural world, owls are hawks competition. They are solitary nocturnal predators. In a way, I think this corresponds to witches very well – especially those like myself who for one reason or another always seem to end up a solitary practitioner. Metaphorically, this has translated in mythology that owls have the ability to detect deceptions. The owl is all about perceptions and is associated with psychic abilities, the moon, witchcraft, and clairvoyance. Owls are associated with occultism as well: not all pagans practice witchcraft. Not all pagans are witches, or even believe witchcraft and shamanism are “good.” I however, happen to be a Pagan who is also a Witch. These attributes of the Owl correspond to my own abilities and weaknesses in life, for these reasons I believe I have been led to the path of owl magic. For me, in my personal practice, I have come to view the owl as a protective spirit guide. First, my own personal experiences with owls came during a time when I needed protection, direction, and just some general spiritual help. I have a topaz owl pendant that I wear for protection, and have made many garments with owls to protect me. Owls also represent wisdom, and I strive to learn their lessons. Second, in the animal kingdom, owls are notable for their ability to navigate through the darkness. In a way owls, have taught me to navigate through my own darkness. I use the Owl in meditations when I’m too depressed or can’t find my way. I look to the Owl to find strength. I know I can always call on the owl to help me with whatever I need. Owl magic, essentially, is about seeing in the dark and learning to walk between two worlds: past and present, present and future, life and death, good and evil, innocence and maturity. 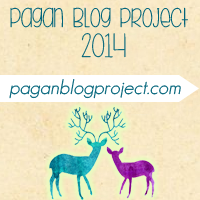 This entry was posted in Pagan Blog Project, Paganism and tagged Pagan Blog Project. Bookmark the permalink. I have yet to find my totem animal, but for some reason I’d never considered meditating on a nighttime forest to find her. Thank you for the idea, and the information on owls.